The nonprofit Honor Flight Network honors America’s military veterans for their sacrifices by transporting as many of them as possible to see the Washington, D.C. memorials of the wars they fought in, at no cost to them. 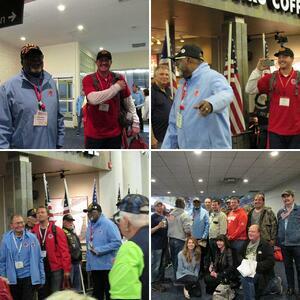 Alcami employee and Vietnam veteran, Herman Anthony, was recently selected for an Honor Flight, and was accompanied by Milwaukee Brewers all-star relief pitcher, Corey Knebel. Herman received a hero’s welcome at the Milwaukee airport from Alcami colleagues, friends, family, and the general public. He recently spoke with Alcami's Marketing & Corporate Communications team to discuss his experience. Thank you for your service, Herman! We salute you, all of the veterans on our staff, and service men and women everywhere.